Breakfast for dinner? Yup, I’m boat that life. 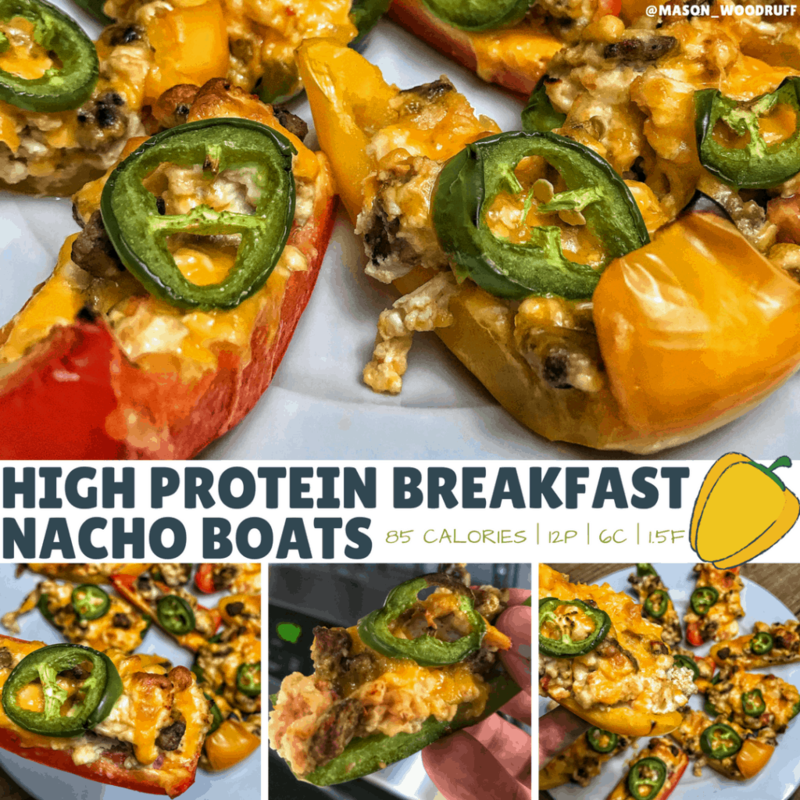 And if you are boat that breakfast life like me, you’ll love these high protein breakfast nacho boats that are packed with flavor and 12 grams of protein per serving with only 85 calories. Okay, that intro was pretty cheesy. But do you know what’s cheesier? Kidding. I’ll stop peppering you with dad jokes at this point. In all seriousness, this high protein breakfast recipe will really spice things up in your diet. All right, let’s get to the recipe before all your eggs start hiding. I’ve heard most eggs are little chickens. 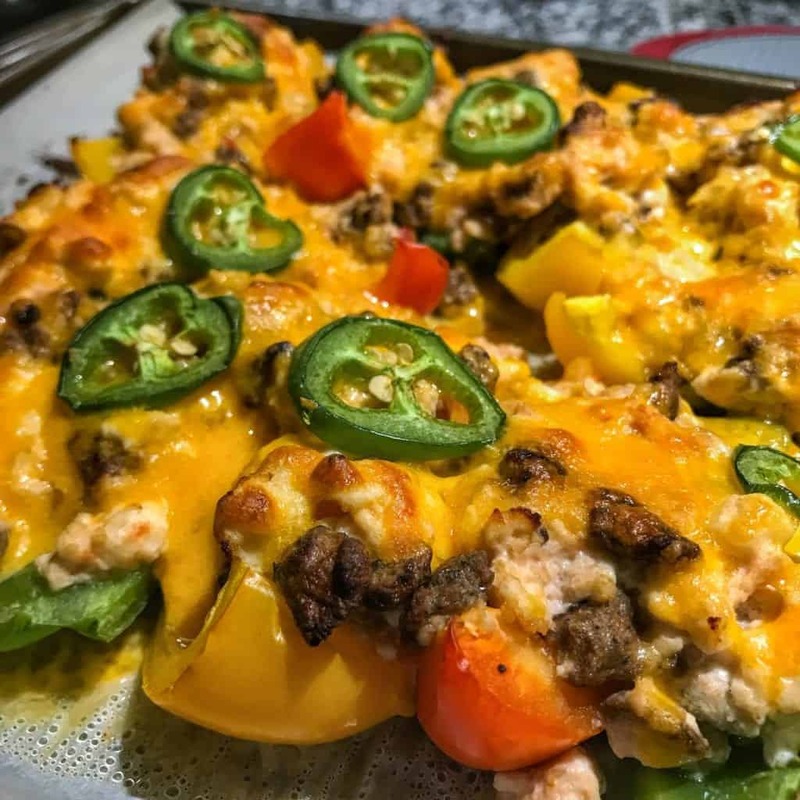 I’d like to give a nod to Gale from SkinnyMs.com for her taco-style skinny nacho boats that inspired this recipe. These breakfast nacho boats come with a ton of different options and a world of possibilities. The recipe below is the easiest and one of the most macro friendly versions I’ve made. It calls for egg whites and turkey breakfast sausage, which could easily be swapped for whole eggs and bacon. If you have higher calorie or fat needs, adjust accordingly. 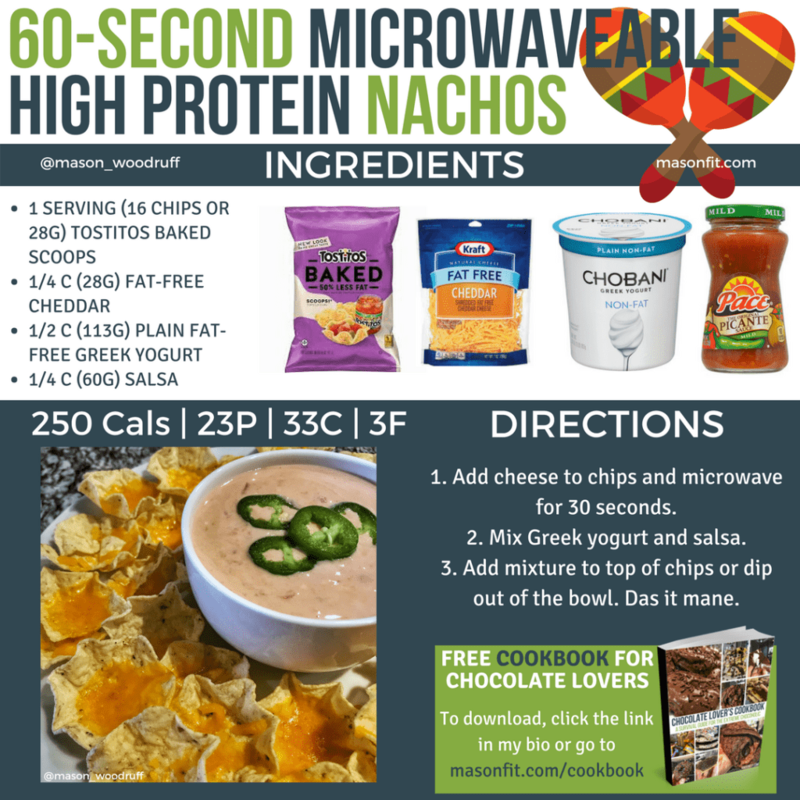 Outside of the base protein sources, you could swap the cream cheese for fat-free Greek yogurt if you wanted a less creamy mixture in your nacho boats. And you could omit the salsa or add in fresh sliced onions and tomatoes if you’d like. Lastly, these taste great with a bit of guacamole and hot sauce after they come out of the oven. One final note: Be sure to cook most of the moisture out of your egg whites and cream cheese mixture. If it’s too runny, you’ll have a difficult time filling the nacho boats without a mess. Even when you get it right, I recommend pushing your nacho boats together, side by side. After they come out of the oven, it’s easy to slice between them with a knife to separate the melted cheese. That’s about all you need to know. 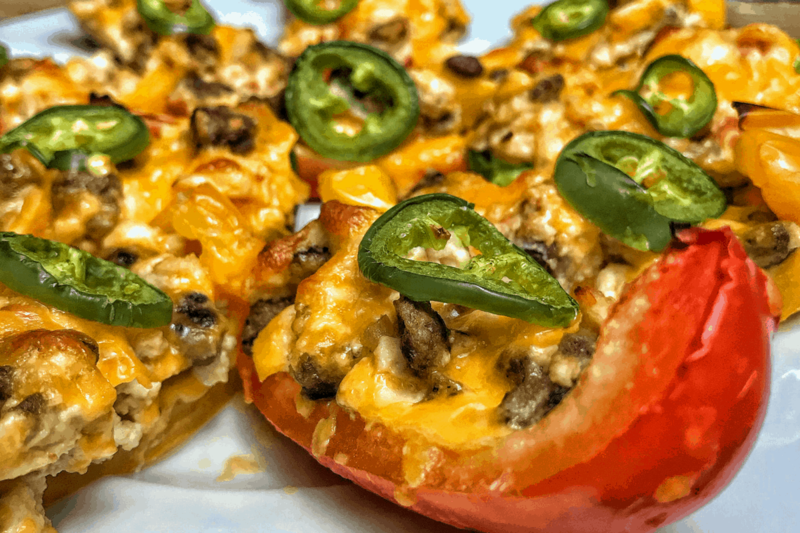 Get creative with your toppings and nacho boat filling! 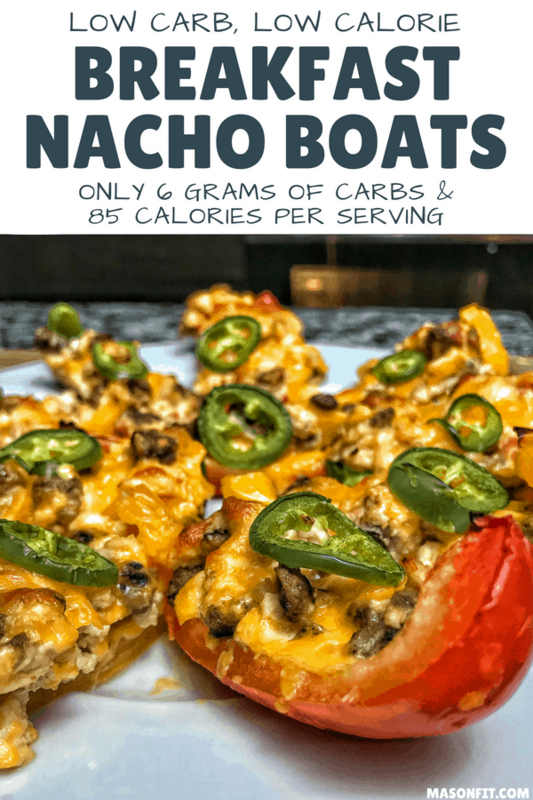 Update: I’ve found that using the Greek yogurt and salsa combo from the bachelor-friendly nachos recipe is fantastic on top of these nacho boats. 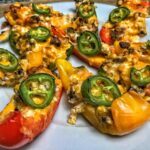 High protein breakfast boats with fresh peppers and low fat cheese. In a large skillet, heat pre-cooked turkey sausage over medium heat (2-3 minutes) before adding egg whites and reducing heat to low-medium. While egg whites and sausage cook, remove seeds and slice each bell pepper into 8 vertical slices (cut into quarters and then cut those in half, vertically). When the egg whites are no longer runny, add cream cheese and salsa. Stir until everything is blended evenly. Top with fat-free cheddar and jalapeno should you desire. Place in the oven for 20 minutes. Serve warm and refrigerate leftover nacho boats for up to 3-4 days. 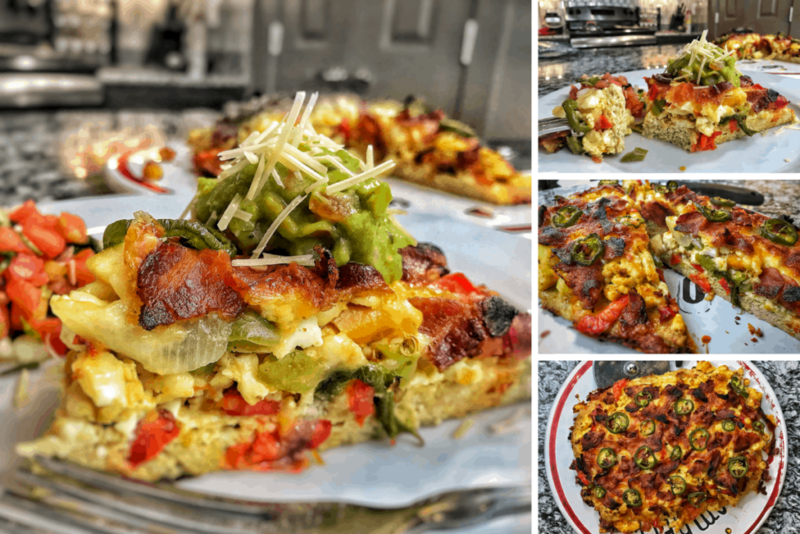 Check out my Low Carb Breakfast Pizza (pictured below) or my High Protein Cheesy Hash Brown Breakfast Muffins recipes next. If you make any of my recipes, I want to see your creations on Instagram. Be sure to tag me in your re-creation and I’ll share it with everyone! These look amazing! I need to try!